Stock # PKA88313, Regular Unleaded V-6 3.7 L/228, Automatic, 21818 mi. LOW MILES - 21,818! 3rd Row Seat, Rear Air, CD Player, Back-Up Camera, iPod/MP3 Input, Flex Fuel, REVERSE SENSING SYSTEM, DUAL BUCKET SEATS W/DR MANUAL LUMBAR.. REMOTE KEYLESS-ENTRY KEYPAD, POWER RUNNING BOARD CLICK NOW! Third Row Seat, Rear Air, Back-Up Camera, Flex Fuel, iPod/MP3 Input, CD Player. MP3 Player, Third Passenger Door, Electronic Stability Control, Brake Assist, 4-Wheel ABS. POWER RUNNING BOARD, REVERSE SENSING SYSTEM, REMOTE KEYLESS-ENTRY KEYPAD, DUAL BUCKET SEATS W/DR MANUAL LUMBAR (21L) 2-way manual (fore/aft/recline) driver and front-passenger seats and inboard armrests, Does NOT include heated seats, Rear passenger seat rows also cloth (STD), WHEELS: 16 STEEL W/FULL BLACK/SILVER COVER (STD). 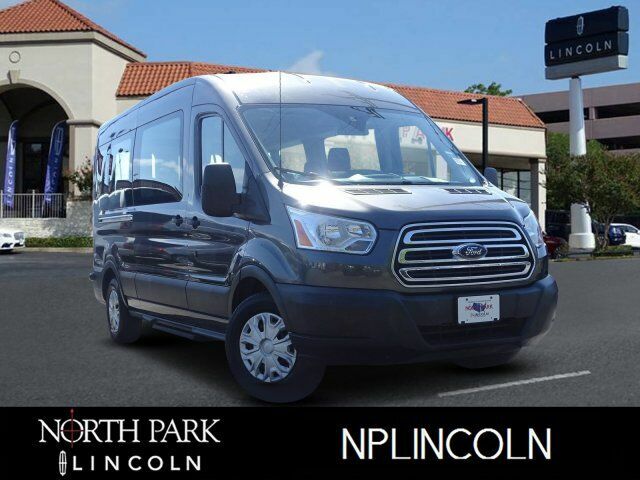 2017 Ford Transit Wagon with Magnetic Metallic exterior and Charcoal interior features a V6 Cylinder Engine with 270 HP at 6500 RPM*.